The most common types of air conditioners are refrigerant-based. Refrigerant is the generic name for the chemical that’s essential to your air conditioner’s cooling functions. Without it, there’s no way to remove warm air from your home! If a leak appears in the system, it will gradually reduce the amount of refrigerant in circulation. This will lead to less cooling power, and—you guessed it—a reduction of cool air. Low refrigerant is almost always caused by refrigerant leaks, which can cause many more problems than just warm air flow, so make sure to call in for repairs at the earliest sign. This is another problem that can be caused by refrigerant leaks, but it can also be caused by a clogged air filter or from short-cycling. The evaporator coil is what absorbs warm air from the inside of your home. If something prevents this coil from absorbing warm air—such as the above-mentioned refrigerant leak—it can cause the coil to get too cold. That leads to the entire coil freezing and will prevent cool air from blowing out. The evaporator coil absorbs warm air, thus leaving cooled air behind. Then, that air is blown into the house by a fan that’s aptly named the blower. Of course, if this fan isn’t working, that air will have nowhere to go. Not only would this prevent air from coming out of the vents, but it can lead to a frozen evaporator coil. Fan motors can burn out simply due to old age. 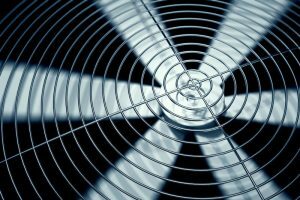 If the AC has had problems in the past, it’s possible that excessive wear-and-tear have caused the fan to burn out early. Alternatively, dust on the fan blades can add unnecessary weight, which can lead to wear-and-tear or may simply obstruct the fan from rotating properly. This is the kind of thing that will make you feel like you’re going crazy. The air conditioner itself may be completely free of problems… no frozen coils, no broken fans, no leaks… Yet, the air coming out still isn’t as cold as it’s supposed to be. When all else fails, the problem might simply be the thermostat itself! Communication to the AC begins with the thermostat, so a thermostat with an inaccurate reading could be what’s causing the problem all along. The thermostat could be busted, but it’s also possible that the thermostat was installed in a bad place, such as in direct sunlight. Low air flow doesn’t have to be a problem! Contact Air On Demand today to schedule a service.